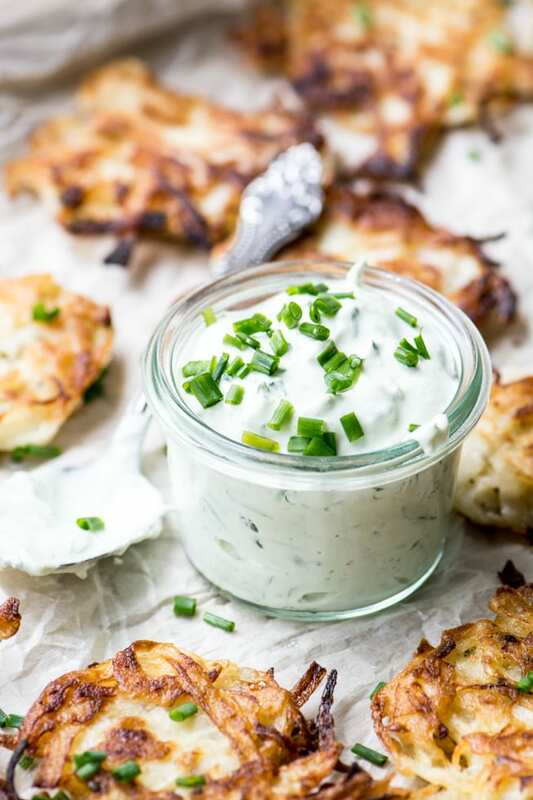 Sweet Onion Latkes with Chive Sour Cream ~ be forewarned ~ the aroma of these crispy onion fritters sizzling on the stove will draw crowds ~ don’t save them just for Passover and Hanukkah! 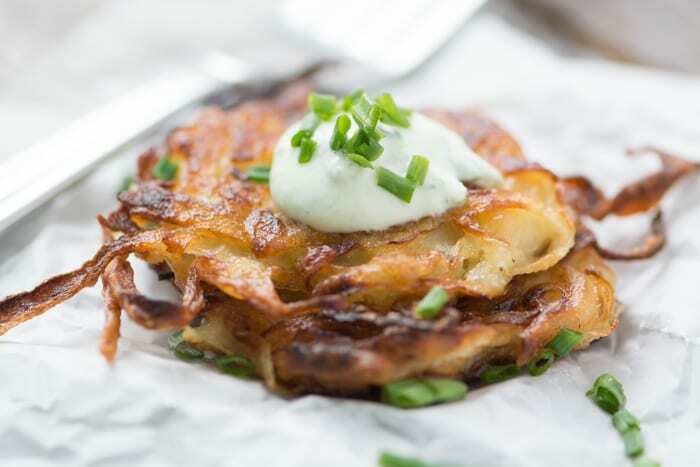 The classic latke, or potato pancake, goes back centuries in Jewish and European food history, but pretty much every culture around the world has some sort of fried vegetable pancake. It’s obvious why…these things are hard to stop eating once you start. 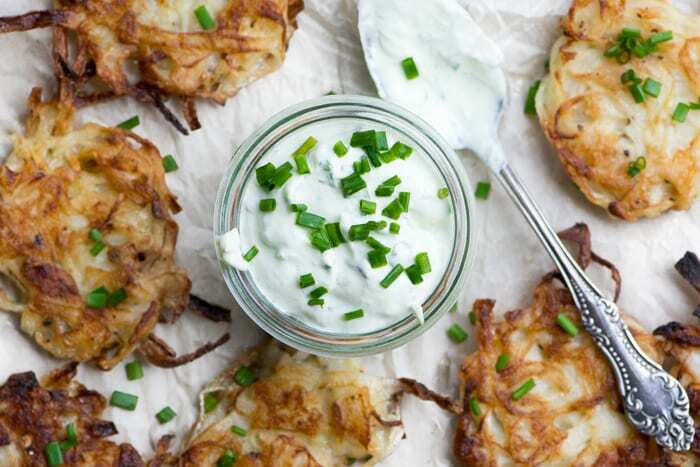 The latkes that most people are familiar with are like little shredded potato hash brown patties. I decided to change things up and use sweet onions instead. Onions have a similar texture to potatoes, and more of a flavor bite. But don’t be afraid…sweet onions are so much kinder and gentler than regular onions! TIP: Sweet onions are sold year round right along with the yellow, white, and red onions in your supermarket. They have a characteristic squat shape and papery skin and they’re milder than other onions. When they’re in season, you can use specialty sweet onions like Vidalia or Maui. Latkes are a homey food that should really be served piping hot right out of the skillet ~ the oil should still be sizzling on their surface as you dig in for you first bite. 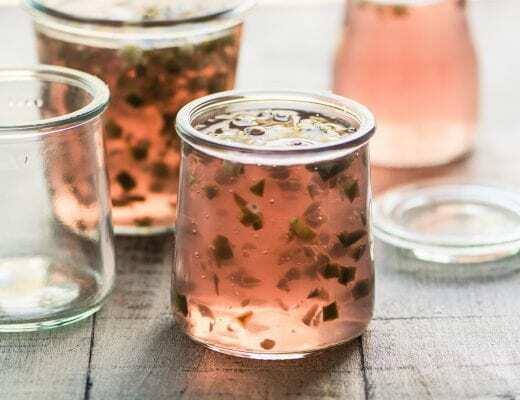 That’s to say, you don’t want to fiddle with them too much, just make a great sauce to go alongside and sprinkle them with some fresh snipped chives. 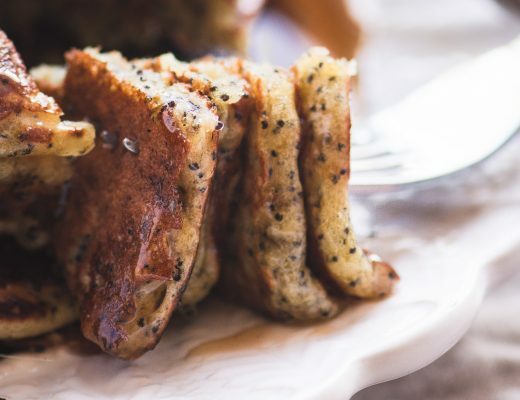 These Sweet Onion Latkes are great with eggs and a cup of coffee in the morning, or they can go with your evening meal as a simple side dish. When you drop the batter into the hot pan, flatten the latkes out a bit with the back of the spoon, and don’t worry about the shaggy edges…they’ll crisp up and become the best parts! TIP: I don’t recommend shredding the onions in a food processor or with a box grater, which can turn the onions to mush…I like to slice them as thinly as possible with a mandoline slicer, and then cut those rounds into quarters. Of course a great latkes is only as good as its sauce, and while it’s traditionally applesauce, I love to experiment with new combinations. Here I’ve blended sour cream with fresh chives and horseradish to make a cool and creamy twist on tradition. For crispy latkes be sure to remove as much moisture from the onions as possible. Be sure your oil is hot, but not too hot. You don’t want them to burn before they’re cooked. Do a test latke to adjust the heat. If you like you can combine equal amounts shredded russet potato and onion for a more traditional latke. To make the sauce, mix all the ingredients together and process in a small food processor. If you like you can skip this step and just stir the ingredients together. 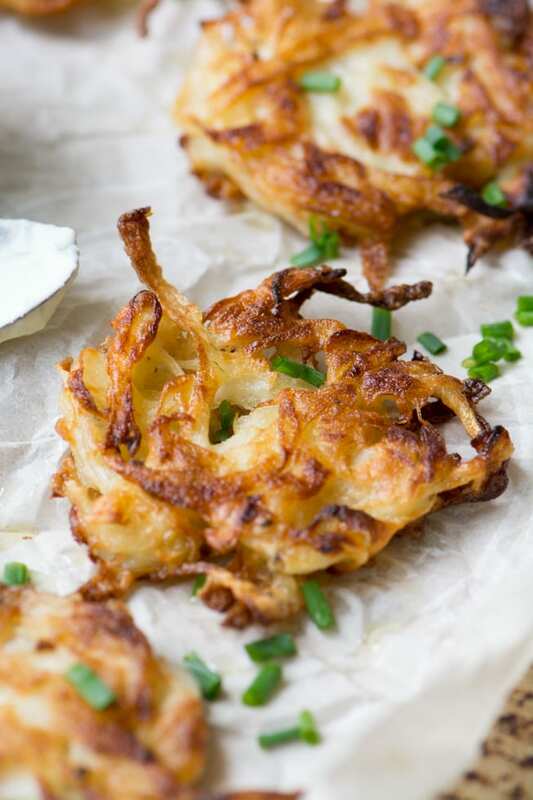 Don’t forget to pin these Sweet Onion Latkes! I made these for dinner today and they were a definite hit. I have tried Latkes with garlic onion. But, this sweet onion latkes looks distinct. The sour cream looks great as well. Thanks a lot for this unique recipe. 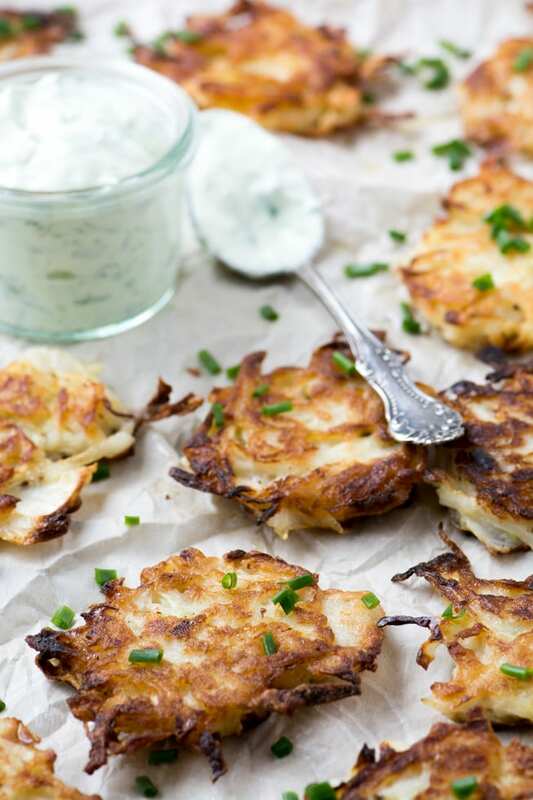 My family absolutely loves latkes and these look perfect. Love the horseradish in the sour cream, especially!! These were fantastic! So easy to make. Followed the recipe and your instructions exactly. Used a cast iron pan which really helped to make crunchy. Thank you for sharing this with all of us. Yes please, a sizzling batch of latkes is just what I need! Love the chive sour cream! Wow – what an amazing treat these would be. I bet they smell terrific sizzling away on a hot griddle! Love that sauce too – horseradish rules! I didn’t put horseradish in the title because I think it scares some people, but it’s such a useful ingredient! I saw some sweet onions at our farmer’s market last week. I love latkes and making them with onions is a great idea. These would be killer made with Vidalias! I would devour the whole portion at one go!! Looks so good! These will be great alongside potato latkes and will help create some variety while not abandoning ‘tradition’. Or am I the only one with family that believe the same foods served in the same dishes on the same tablecloth (etc, etc.) is the only way to celebrate the holidays?? 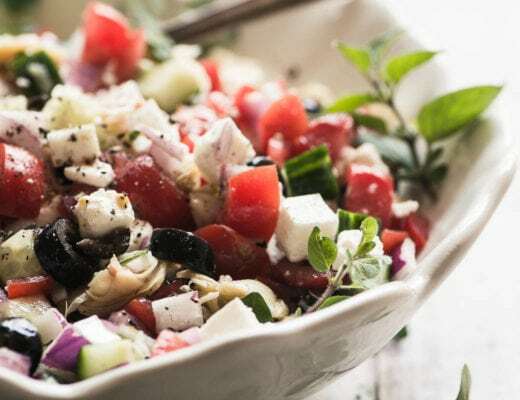 You’re right, twists and tweaks have to be moderated by a good dose of tradition. While reading this, my stomach won’t stop rumbling. Gotta try these. haha, that’s just the response I wanted, thanks Callen!